HI! 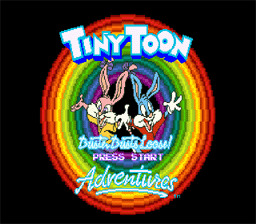 Welcome to Tiny Toon Adventures for the Super NES. I'm Buster Bunny, and I'll be your host through this tour. First, we'll go to ACME Looniversity, where my friends and I go to school. It's a great place to learn from some of the best teachers around. We will also go out to a town in the Old West. I'll be Sheriff Buster Bunny--the long arm of the law--and I'll have to do my gol'darndest to keep Montana Max from ruining the town. There is also a picnic break to get some chow. I hope that doesn't get rained out, but I'm sure we can find shelter if it does. The next stage takes us to Acme Acres Stadium. I, being a great athlete, will show off my amazing football talents. The fifth stage takes us on a hunt for Calamity Coyote's hidden treasure. This will be a chance to get some fresh air. Finally, Princess Babs Bunny (no relation!) of the Kingdom of Acme is kidnapped by the Milky Way Imperial Army. But don't worry, we'll rescue her. Make way for Buster Bunny, Knight of Honor! --From the SNES Tiny Toon Adventures: Buster Busts Loose! instruction manual. Play Tiny Toon Adventures: Buster Busts Loose! Now!